We have some new heavy cotton canvas fabrics in the store with really fun prints. This weight is ideal for home decorating, purses, bags, and crafts. Tough enough for upholstery and so much more! Knit fabrics are becoming more popular all the time, and now we have a group of New Balance knits designed just for activewear. Sew up some bright, unique running gear or make the perfect leggings for a yoga class. These fabrics have all-way stretch so you can move your body unfettered. Made from recycled polyester and lycra, they won't get heavy or sag no matter how much you sweat. The Happy Bicycle - new book and signing event! 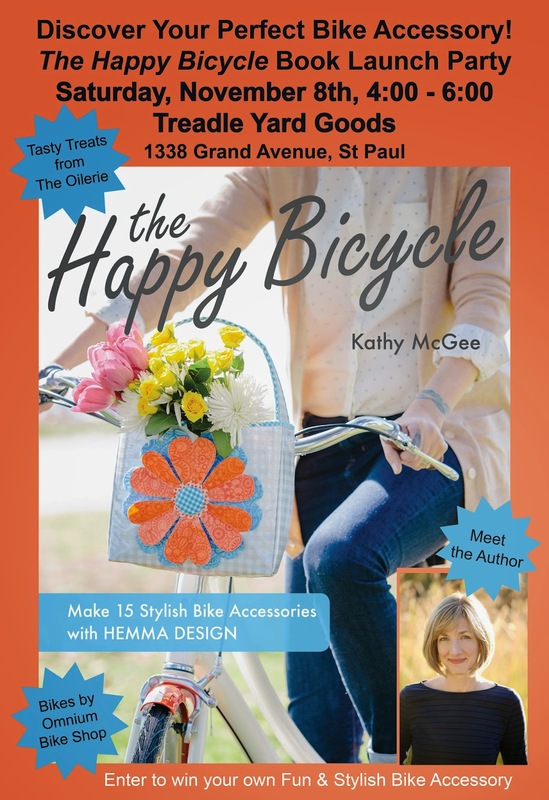 Treadle is excited to host a book signing with local fabric designer, patter creator, and author Kathy McGee of Hemma Design! Enjoy some yummy treats from The Oilerie, chat with the author, pick up your copy of the book, and get inspired to make some fun bike accessories! The book is packed with great ideas and patterns. From bags and baskets to seat and helmet covers, you'll find projects that are practical as well as just darn cute! Here's a little peek. It's all happening Saturday, November 8th, 4-6 pm at Treadle Yard Goods! Have a look at this utterly charming new collection from Birch fabrics. Made from 100% Organically grown cotton, these fabrics are delightful to the touch and better for the earth. The prints feature florals, trees, and adorable woodland creatures. Perhaps the best part - the collection includes a panel to make a doll and 3 soft friends! How many times have you wished the sweet characters in a beautiful print would step off the fabric? Well, now they can! Just cut, sew around the outlines, and stuff! PLUS! Several of the prints are available as cotton knits! Soft and comfy for all kinds of apparel sewing. Our Fabulous Fall Sale continues! Stop by today and get at least 20% every fabric in the store! Check out this fun class starting this Wednesday at Treadle! This quilt is created with one block in the manner of One Block Wonders by Maxine Rosenthal. Easier to make than it looks, rotary cut triangles are used to create the hexagon shapes. Then play with the block layout and the results are stunning! Recommended prerequisite: Beginning Quilting or other basic quilting class. To register, call us at (651)698-9690, or stop by the store. You can see our full listing of classes at our website. We have some new knit fabrics from Amy Butler's Glow collection. Bright, modern, packed-in florals and multicolored polka dots give an amazing pop to these knit prints. Treadlette Sue has combined two of the prints to make Kwik Sew 4084, a mock-wrap-front knit top with fun color blocking and a flattering diagonal line. Way to go, Sue! Knits are fun, flattering, and versatile, and with Amy Butler's eye for color, they really make a statement! Our Fall Sale continues! Stop by soon for some great discounts on amazing fabrics! It's time for our annual Fall Sale! ALL FABRICS in the store will be at least 20% OFF, with selected groups 30-50% off! This includes silk, wool, oilcloth, felt, knits, and so much more, including brand-new fabrics! Plus, selected ribbons are 50% off! The sale starts tomorrow, Thursday October 16th and runs through Sunday the 26th. Shop early, shop often to get the best deals on great fabrics. New wools from Pendleton are available at Treadle! Pendleton is famous for creating superb American-made woolens for over 150 years, including their classic Southwest-inspired designs and thick blanket-weight fabrics. Ideal for winter coats or home decor, these soft, warm wools are truly a treat. Learn to embroider by hand! Practice your stitches by making a stitch sampler or practice piece, or dive right in to a design for finishing! The samplers below show a few of the stitches we will cover, including satin, feather, chain, and stem stitch. You'll also learn how to transfer your design to fabric and how to block your finished piece. All skill levels are welcome! You can find our complete class schedule at treadleyardgoods.com/classes. 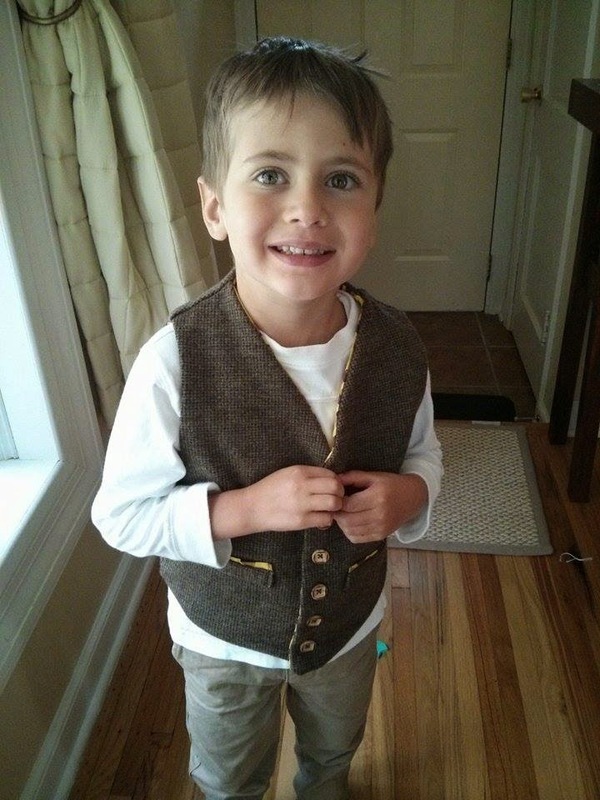 Treadle customer Vanessa recently made this adorable buttoned vest for her 5-year-old son. 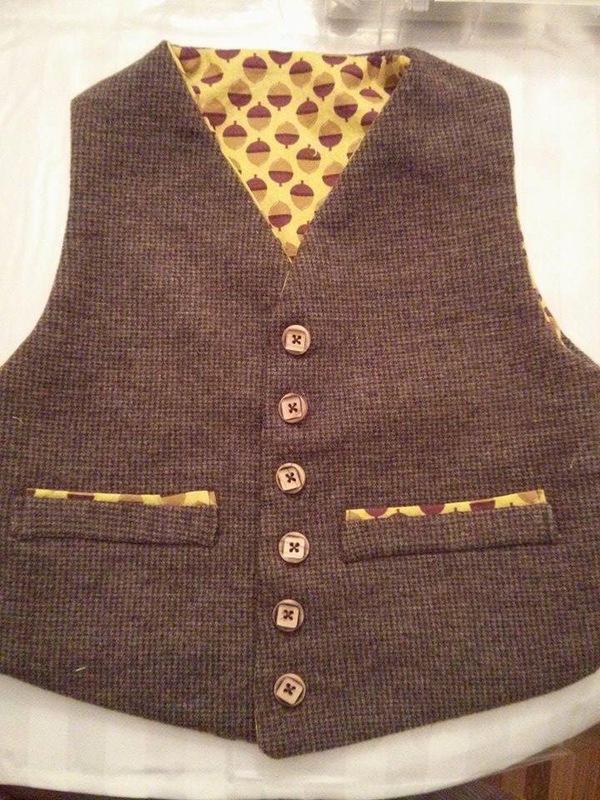 Using a soft wool fabric paired with a fun print lining, Vanessa made a kid-friendly garment that looks seriously good to grownups, too. Stop by and check out our huge wool selection to see what kind of projects you can cook up. And keep your eye on this blog for more fabric updates, including a new shipment of Pendleton! We have some great new prints from local designer Kathy McGee, also known as Hemma Designs. If you like Kathy's style, then stay tuned for more news from Hemma, including a new pattern and book available at Treadle!